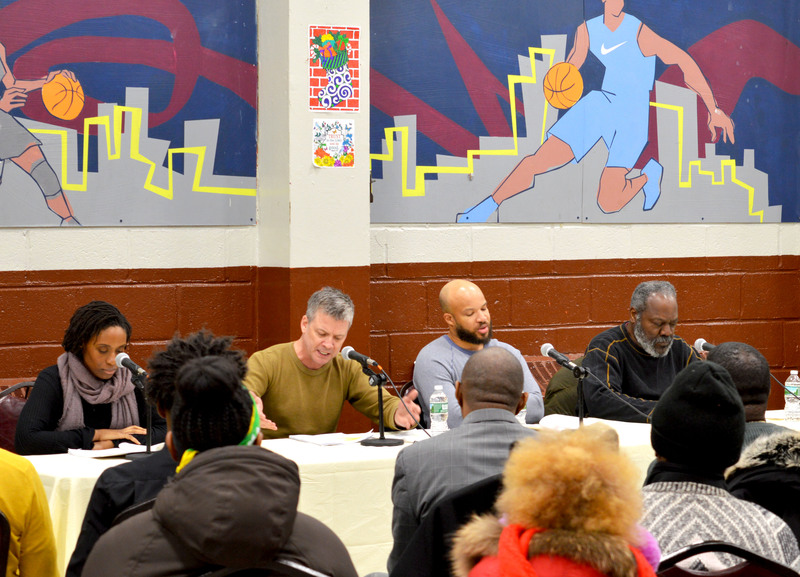 Last month, CAMBA hosted the Theater of War Productions’ for a presentation of Hercules in East New York in the Louis H. Pink Houses Community Center in Brooklyn. The lively evening included a dramatic performance of the classic Greek tragedy The Madness of Hercules by Euripides, a play that echoed the same sentiments of the impact of violence on a community. The project was directed by Bryan Doerries, who coupled the piece with a modern and relevant performance of how gun violence impacts communities. Click here to watch the Brooklyn News 12 story about the performance. The play was followed by a panel discussion with Marcus Scurry, Program Director of CAMBA Cornerstone, Andre T. Mitchell, Founder of Man Up!, Dr. Divine Pryor and Tyris Sylvester, who is a member of the Cornerstone’s Youth Council. The night’s performance and discussion was, unfortunately, an extremely pertinent topic for the community due to the recent gun killing of a local shop owner. “When a shooting happens, it’s not just the two people involved: it’s a community that is involved. And our community needs to be healed,” said Wesner Pierre, Vice President of Community Centers at CAMBA. The production was performed by seasoned Broadway and Film actors Glenn Davis, Frankie Faison, Chris Coffey, and Chinasa Ogbuagu free of charge for students, artists, and community members. This project is closely linked to the cause of CAMBA’s Brownsville in Violence Out (BIVO) program that engages young people to reduce their exposure to gun violence and gangs. The local Brooklyn 12 News covered snippets from the production and along with words of encouragement from actor Frankie Faison. Thanks to this dynamic collaboration, CAMBA and the Theater of War Production produced an event that displayed how the power of conversation with a community can bring solutions to ending gun violence.